One of the most overlooked disaster planning measures is a sanitation and hygiene plan just in case there is a disruption of sanitation services and access to hygiene supplies. People don't realize that a lack of proper sanitation is the leading cause of disease and death and can even claim more lives than the disaster itself. Disasters typically damage existing sanitation facilities and displace people, increasing pressure on facilities that may already be under strain. When preparing your household for disaster, be sure to include enough supplies to reduce the possibility of disease as much as possible. It is extremely important to stay as clean as possible. Frequent hand washing, or use of an antibacterial hand sanitizer. Extra care should be taken when handling and cooking foods. When using stored water be careful to not contaminate the bottle cap or neck of the bottle. In a survival situation extra precautions should also be taken to prevent cuts, scratches, or scrapes. Any time the skin is broken the wound, however slight, should be treated, immediately. Watch children closely. They tend to ignore minor injuries, fearing treatment more than they do disease. Many elderly people also ignore minor wounds because they do not want to be a bother. Two commodities that are always in short supply following a disaster are drinking water and toilet paper. Always have basic sanitation supplies on hand. Add these supplies as you are able. 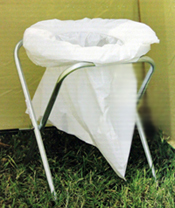 Garbage bags – they can be used for improvised wash basins, toilet liners, trash containers, and for waste disposal. Keeping clean is essential to good health. Because water is so precious it should be reserved for drinking purposes, consider other ways to wash the body. After a disaster, act as if everything is covered with germs. Continue rubbing your hands for at least 20 seconds. Washing hands with soap and water is always the best way to get them clean. If that isn't an option, the second-best way is to use a hand-sanitizer. Hand-sanitizers aren't perfect, but they are a good second choice. They don't take care of dirt and they don't wipe out all kinds of germs, but they are better than nothing. In order to reserve your emergency water for drinking and cooking consider using waterless bathing products. Here are some highly rated products for you to consider in your quest for disaster supplies that really work.